While construction progresses on the new International Arrivals Facility at Sea-Tac airport, Port employees have continued to look at ways to improve the customer experience at the South Satellite, even as growing passenger volumes continue to far exceed the current facility’s capacity. Keri Stephens (AV Facilities & Capital Programs), Sabin Mudaliar (AV Operations), and Diane Schairer (Continuous Process Improvement) led a cross-functional team that focused on solving some problems with traffic flow in the airport bag well. Their initial goal was speed, but focus shifted to safety after observing the work. Drivers would haul bags on tugs from aircraft to conveyor belts, and compete with each other to dash in to the building and drop the bags off. They could enter or exit through any of nine doors, and turn around in the middle—right on top of the pedestrian walkway. The team spent months analyzing the problem, measuring time from aircraft to input, measuring volume of bags, and planning how to engage the drivers. In November 2017, they convened the first meeting of a broader team that included representatives from ground handlers and airlines, especially the tug drivers who were actually doing the work. They examined the current situation together, identified the main problems, and recommended different ideas to test based the best knowledge and experience of the drivers themselves. Limiting the number of routes and access points may have seemed counter-intuitive to improving speed and flow, but it’s a good example of how increasing safety can also improve efficiency and reliability. New “one-way” routes reduced cross traffic and removed opportunities for collisions. Without the pressure of having to make quick routing decisions at high speed, drivers have commented that it feels calmer. Bag delivery times have also improved, and the Port’s Business Intelligence team is currently working with some of the team members on a new dashboard to display progress. The new traffic standards were implemented January 16, and the team has re-convened quarterly since then to check progress and continue to improve. In the first week, team members from Delta and Swissport were out on the ramp every day helping to communicate with drivers, explain the new traffic pattern, listen to their feedback and make adjustments. Over time, communication and cooperation have supplanted a previously competitive environment. This project reflects values that the Port is all about, with teamwork, safety and customer service at the core. Congratulations to the team on winning the Q2 2018 Innovative Idea Award. 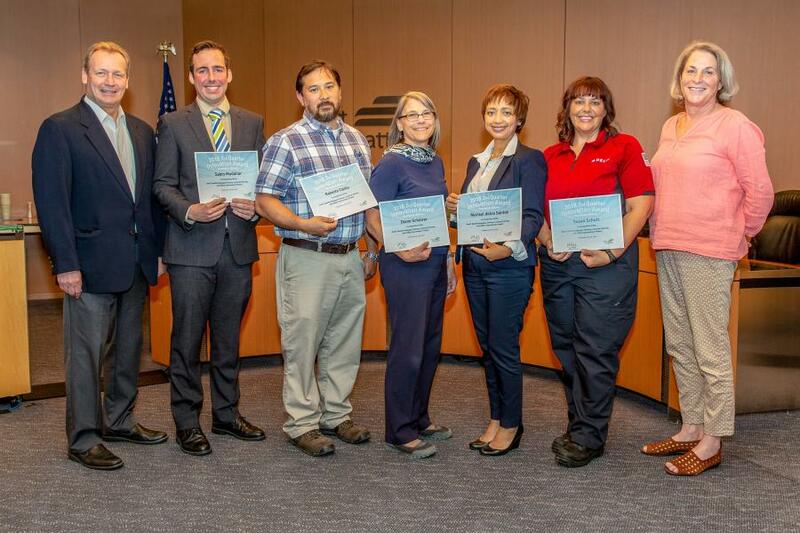 Keri Stephens, AV Facilities & Capital Programs; Sabin Mudaliar, AV Operations; Diane Schairer, Continuous Process Improvement; Roberto Cantu, AV Maintenance; Dave Crowner, AV Airfield Safety. This team, representing AV Business Development, Properties, Landside Operations, Environmental, Planning, ICT and Business Intelligence, thought out of the box to develop a creative solution to reduce carbon emissions and roadway congestion from TNCs dropping passengers off at the airport. TNCs truly represent a disruptive technology that has challenged the airport. In this case, the team was looking for creative ways to allow a TNC dropping off to avoid deadheading—driving back to Seattle without passengers. Through “Rematch,” a TNC dropping off can now circle quickly through the garage and come in to pick up a departing passenger. This reduces the vehicle’s carbon emissions by at least 50%, and reduces congestion on the airport and regional roadways.